The Granite Belt …. renowned for its apples, stone fruits and for producing some of Queensland’s finest wines. With more than 50 wineries in the region, we can cater to every taste in both red and white wines. The produce in the area includes apples, pears, peaches, plums and vegetables. At 1000 metres in elevation the air is certainly clearer, and definitely cooler, with winter often experiencing sub-zero temperatures. The region also plays host to popular family festivals like the ‘Apple and Grape Harvest Festival’, ‘Snowflakes in Stanthorpe’ and ‘Jumpers and Jazz in July’. Located on the New England Highway near the New South Wales border, Stanthorpe is 223 kilometres from Brisbane (via Warwick). 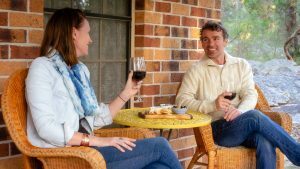 Wineries, National Parks, Bushwalking, Rock pool swimming, Fishing, Quality restaurants, Wildflower walks, Fossicking, Art, Antiques, Freezing winters …. the perfect weekend getaway.